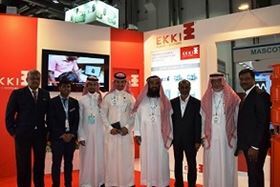 Mr. P. Arumugam, Chief Executive, EKKI Group and Mr.Kanishka Arumugam, Director, EKKI Pumps with delegates at Dubai’s Big 5 Expo. The sump submersible range starts from 0.5 HP and goes up to 90 HP. It features in both horizontal and vertical construction and consists of around 550 Models. The vertical construction sump submersibles come in a multistage design, which can deliver high head up to 320 m and a high discharge flow up to 540m3 per hour. The sump submersible pumps can be used to draw water from any type of clean water sumps such as tanks, wells, rivers, lakes and dams across agriculture, building services and public utilities markets. They have significant advantages over the traditional surface monoblocs and multistage pumps. They are completely submersible, and save space as no pump room or construction space is needed. In addition, they transport water far more quickly with no noise, a better cooling effect on the motors. The single shaft construction in the sump submersibles enables a more sturdy construction and the shaft alignment is specifically designed to reduce the vibration issues. They are also designed to with stand high voltage fluctuations which enables an extended life cycle for the pump.